For Annette Labedzki, paint-mixing is as strange — and oddly satisfying — as the trend itself. On Instagram, no one comes close to the Vancouver artist. For Annette Labedzki, paint mixing is as strange — and oddly satisfying — as the trend itself. It was one of the biggest trends of the summer, at least on Instagram. Search the hashtag #paintmixing and you'll be served more than 36,000 hits — short videos that largely feature disembodied hands slowly blending globs of paint, pigment and (on special occasions) sparkles. It's an unusual video trend, though no more unusual than most — please see "#slime" — and one that seems to either relax or disturb viewers. Each post is a kinetic ink-blot test — or paint-blob test, really — and of all the paint-mixers out there, nobody comes close to Annette Labedzki. With 266K followers and counting, the Canadian artist is Instagram's pre-eminent queen of the painter's palette. And to the long-time artist, her new Internet fame is as strange — and oddly satisfying — as paint-mixing itself. Since graduating from Emily Carr University in the early '90s, Labedzki says that she's been a full-time professional painter, and when she joined Instagram a few years ago, she was using it to share pictures of her work, abstract figurative paintings she creates out of her garage studio. "Not a lot happened," says Labedzki. Then, some time in early May, she tried paint mixing. "I saw a few (videos) on Instagram, and I thought, 'Why don't I try that? That's what I do anyway.'" After her first post, Labedzki's follower count exploded "pretty much instantly." "I had something like 8,000 followers," she says, and it's only gone "up and up since then." "People just loved them and I love making them, so it just went nutso." The videos themselves are simple, deceptively so. "Some rude people, say, 'Oh, I can do that,'" she says. "How little do you know how much is involved." The colours, for example, are brilliant both before and after Labedzki's had her way with them. No muddy, pea-soup browns here. Every combination creates a vivid and sometimes surprising result, and that requires a special knowledge and talent. "It's instinct, you know – instinct and little visions," she says of her methods. "That's it, there's no recipe." But she approaches each video with the audience in mind, and she's happy to give them what they want so long as their demands are appealing. 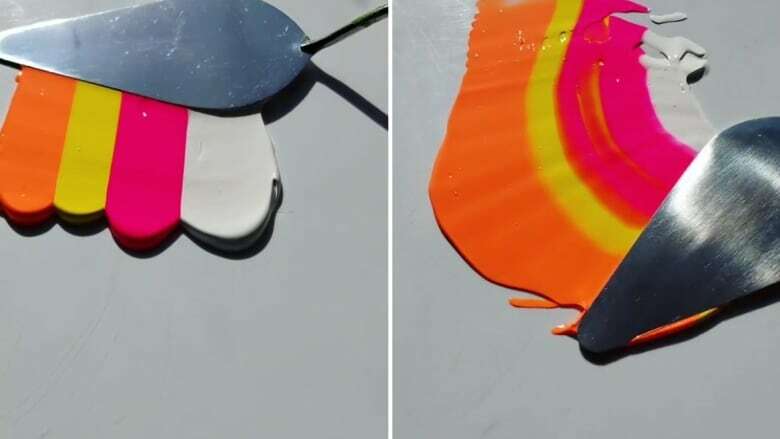 When people started dropping comments about the satisfying scrape or slosh of acrylics on plastic, she started experimenting with sound — squishing around in the paint with gusto and trying new tools. They leave the most hearts on posts featuring violets and hot pinks and metallics, so she gave them more. "I feel like a performance artist, to tell you the truth," says Labedzki. "I've tried to film when I'm applying the paint and it's just way too stressful," she says of her attempts at live painting, versus live blending. "I'm by nature very shy, and painting to me is so personal. It's so stressful to paint with the camera on." "Just recently I was trying to figure this out, and I thought, 'Painting is very secluded and isolated and the paint mixing is more of a performance art in front of people.' I seem to be two artists right now, which is also a surprise. I didn't know that I have this side of me, in me." But the biggest surprise of all is that there's a massive Instagram audience for something every painter does, but doesn't necessarily stop to film on their iPhones. "There's a large part of me that doesn't know what's going on and can't quite figure things out," she laughs, but she has one theory. "I really believe it's what colour does to the brain. The transformation of blobs of colour into one brand new colour — I think it's like a drug for the brain." See more from Annette Labedzki on Instagram and on the new episode of Exhibitionists. Watch online or Sunday at 4:30 (5 p.m. NT) on CBC Television.